As promised in my short review of the Canon MP970, I’ll follow-up on a quirk in the Canon MP970’s handling of Letter-sized Canon Fine Art Rag paper (FA-PR1) — a matte specialty paper Canon sells for use with the MP970 printer (among others). Perhaps this will save other owners of the MP970 hours of bafflement. First, please note that the package in which the “Fine Art” paper arrives proudly states each sheet is 8.5″x11″. 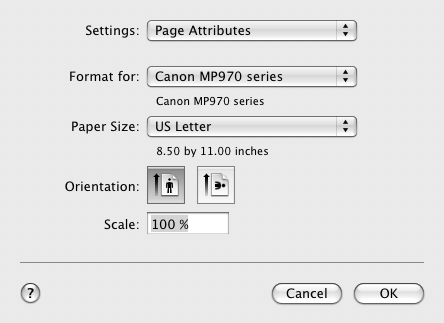 You might be thinking to yourself, “I can print on this paper if I set the printer to use a US Letter page size!” That is a very silly thing to think. My intent was to make two 4″x6″ prints on each sheet of 8.5″x11″ paper. 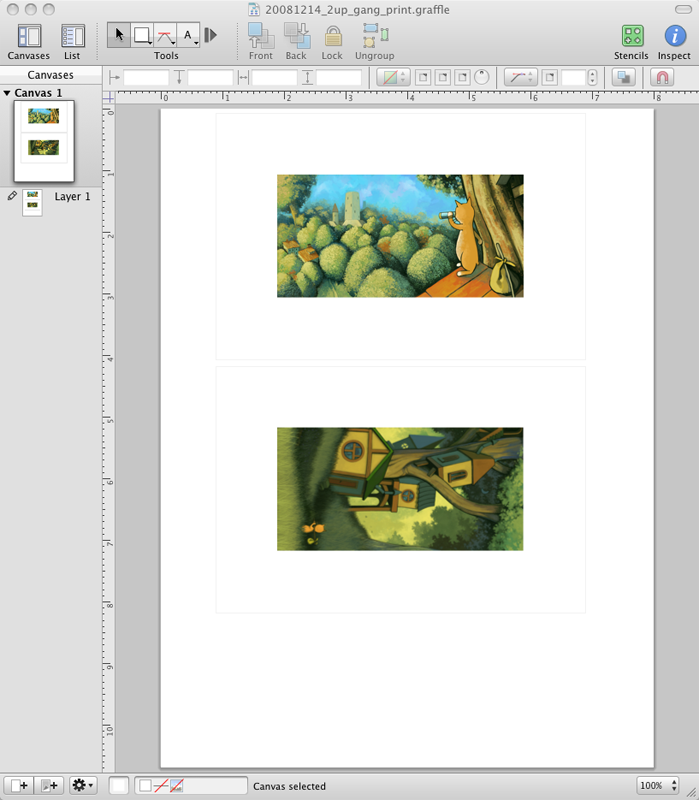 As usual, I set the print job up in Omnigraffle on a “US Letter” page. 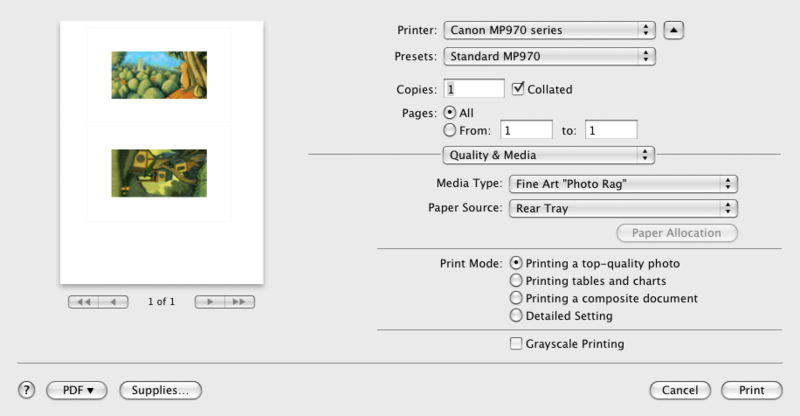 Here is a snapshot of the default “Page Setup” dialog in which the correct printer and paper appear to be selected. We’ll return to this in a moment. Oh yes. The only other setting to check is the output quality and media. “Fine Art Photo Rag” is the “Media Type” and “Top-quality Photo” is the “Print Mode”. 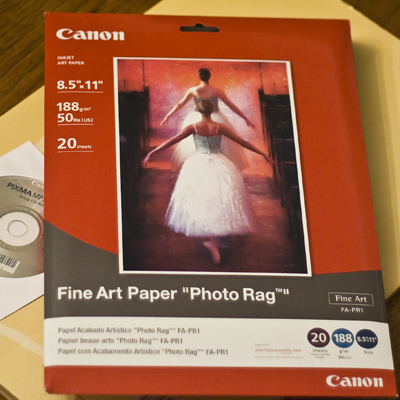 Here’s the trick: Canon treats “Fine Art” paper (FA-PR1) differently from “US Letter” paper. 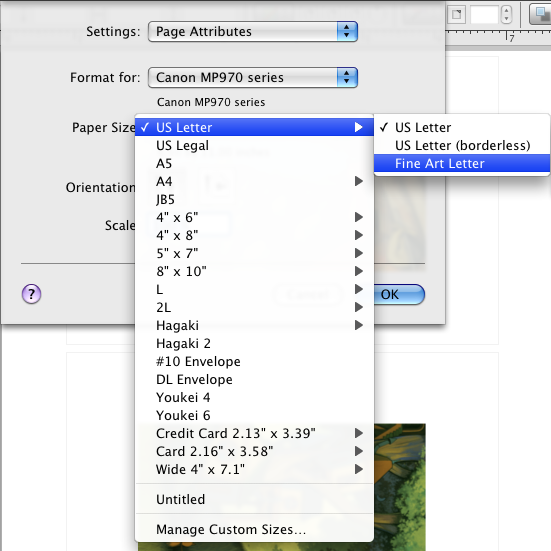 To print to “Fine Art” paper, you must dig into the paper sizes in the “Page Setup” dialog and specifically select “Fine Art” paper under the option for “US Letter” paper. Thanks, Canon, you bunch of nimrods. 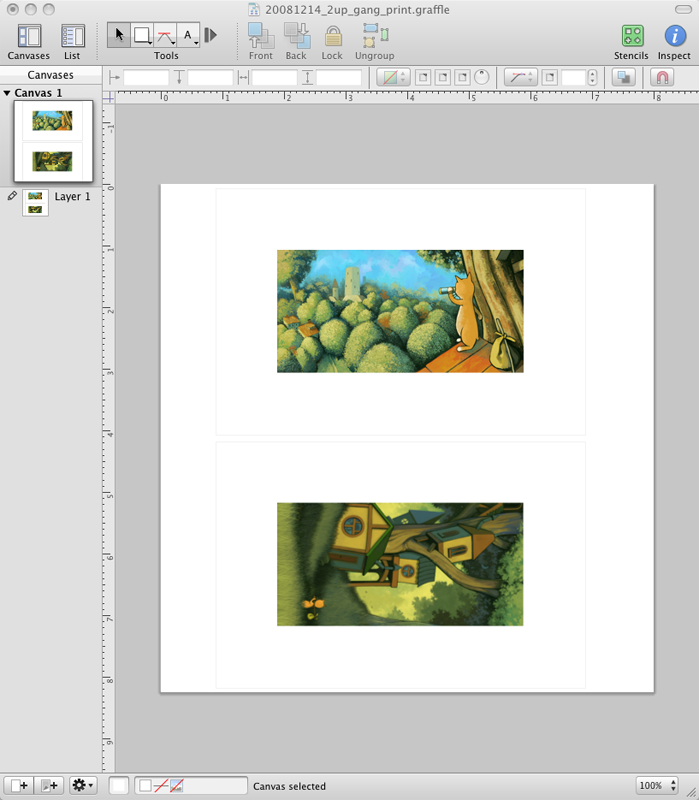 Note, however, that selecting the “Fine Art” paper size will drastically adjust the printer margins. Compare the following image to the “US Letter” layout above. In the end, you are left with a diminutive 8.25″x8″ print area — just enough to fit two 4″x6″ prints, but obviously not enough to handle two 5″x7″ prints or one 8″x10″ print. Working around this limitation may involve lying to the printer. I’ll relay any such experiences in a future post.